The NozzleCheck is a non-slam check valve first developed in 1935. The first NozzleCheck valve installed in a nuclear power plant was in 1972; since then it has replaced over 800 conventional check valve designs. 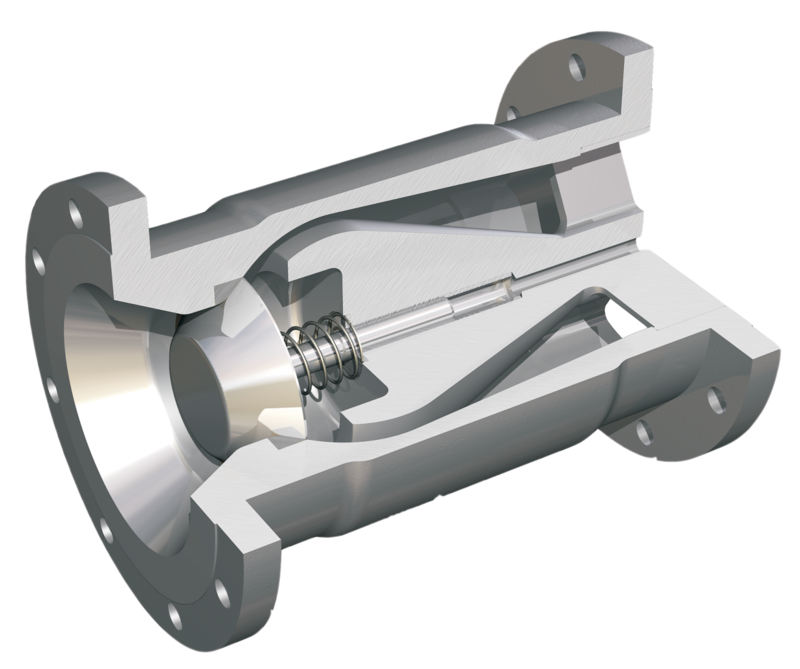 Specifically designed to combat damaging transients and water hammering, the NozzleCheck valve has been improving systems in some of the most demanding nuclear plant applications. With a number of designs, NozzleCheck offers check valves for large and small bore, dirty, high capacity, and severe service applications. In 1992, Curtiss-Wright Nuclear started manufacturing NozzleCheck valves under its Appendix B Program. Since that time, Curtiss-Wright Nuclear has been exclusively offering ASME Section III Class 1, 2, and 3, Safety-Related and Commercial NozzleCheck valves to the nuclear industry. The NozzleCheck DRV-Z is an axial flow, inline check valve. 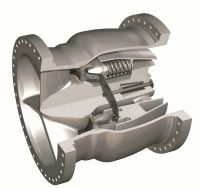 Similar to a conventional check valve, the DRV-Z allows forward flow under normal conditions, opens quickly with ease, firmly backseats at a low velocity and closes on a reverse flow with minimal seat leakage. The DRV-Z provides a maintenance free design using minimal moving parts and a very short stroke to provide a rapid non-slam closure. This makes it a perfect choice for vertical and horizontal pipe configurations and is ideal for installations near sources of turbulence such as elbows, reducers, pumps and orifices. The DRV-Z model is well suited for small bore applications protecting critical equipment from reverse flow, containment isolation of pressure boundary penetrations, excessive tank vacuum and high energy line break isolation. The DRV-Z small bore axial flow inline check valve is able to allow full forward flow under normal operation. As forward flow velocity reduces to a specified minimum (Vmin), the spring assisted disk firmly closes, preventing reverse flow. The DRV-Z employs a streamlined diffuser that minimizes pressure loss. A disk/stem assembly also provides a rigid structure within a low friction surface to minimize wear. Disk closure relies on differential pressure with assistance from the spring. The DRV-Z can be selected for applications with a specified Vmin or opening pressure to meet system requirements. The DRV-B is used for large bore check valve applications where high capacity is required. It has a donut shaped disc allowing flow through the inside and outside of the disc. The disc is free floating and does not rely on the alignment of any guiding surface for proper seating. Large bore axial flow check valve. The DRV-B typically uses 3 helical springs to control the closing speed and apply additional seat load under low differential pressure conditions. The DRV-B has a diffuser that allows a smooth transition of areas reducing pressure loss and creating a low-pressure area behind the disc to create sufficient force to fully open the valve. The DRV-B is installed to allow flow in only one direction. As pressure is reduced on the inlet side compared to the outlet, flow will reduce. When the flow is reduced to a point, depending on the spring strength, the valve will start to close. It will fully close at nearly the zero flow condition. Three or four helical springs are used, depending on valve size, to provide a closing force. Springs are sized to be strong enough to close quickly to eliminate waterhammer and weak enough to allow full open operation during normal operating modes. 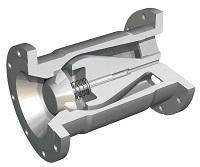 The DRV-BK is used for large bore check valve applications where a narrow face-to-face is required. It has a donut shaped disc allowing flow through the inside and outside of the disc. The disc is connected to a center shaft. 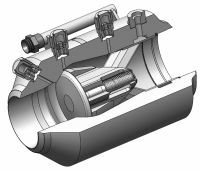 The DRV-BK has one helical spring enclosed within the center body section to control the closing speed and apply additional seat load under low differential pressure conditions. The DRV-BK does not have a diffuser like the DRV-B and DRV-Z. The DRV-BK is installed to allow flow in only one direction. As pressure is reduced on the inlet side compared to the outlet, flow will reduce. When the flow is reduced to a point, depending on the spring strength, the valve will start to close. It will fully close at nearly the zero flow condition. The center spring provides a closing force. Springs are sized to be strong enough to close quickly to eliminate waterhammer and weak enough to allow full open operation during normal operating modes. In some applications the fluctuation in pressure, downstream leaks, or other phenomena can result in constant chatter of a check valve causing hinge pin wear or damage to the seating surface. The DRV-N, Normally Open NozzleCheck valve, has been designed to withstand the rigors of these types of applications. This particular design has a similar body configuration to the Model DRV-Z, but rather than a normally closed design that is opened using system pressure, the disc in the DRV-N is opened using a spring. 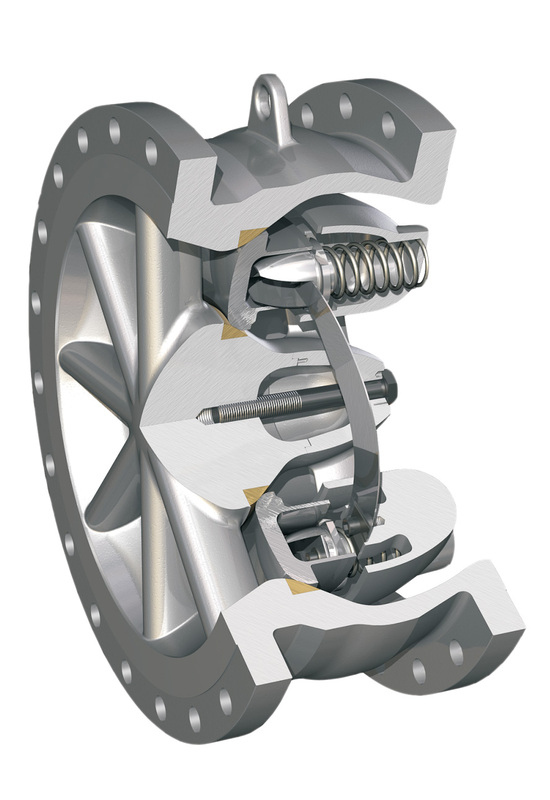 As a result, the valve is unaffected by pressure changes and the problem of constant cycling is avoided. Furthermore, the DRV-N employs the use of a stem guide rather than a diffuser. This feature provides a less congested flow path so that the backpressure can effectively close the valve when flow exceeds normal levels. When closed, the disc is self-aligning and finds the best seating position to form a tight shutoff.